Cait Healy, a 21-year-old student from Clonakilty, Co Cork, is the first winner of the annual Market Lane Group Culinary Scholarship, an accolade which will help her realise her dream of becoming one of Ireland’s young culinary entrepreneurs. 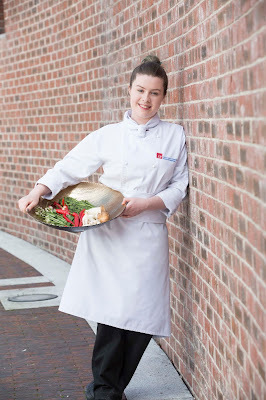 A student in the Department of Tourism & Hospitality of the Cork Institute of Technology (CIT), Cait has just finished her Bachelor of Business in Culinary Arts and will now, thanks to the scholarship, go on to study for a Bachelor of Business (Hons) in Culinary Entrepreneurship. Last year Cork’s progressive Market Lane Group teamed up with the Department of Tourism & Hospitality of CIT to create this annual bursary to help culinary students fund their future studies. 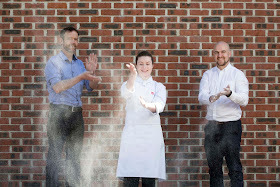 This is the first scholarship of its kind in Ireland to be offered by an industry partner and it underlines the Market Lane’s belief that working more closely with colleges and investing in student learning is the way forward for the industry. Cait’s winning dishes all contained local produce including fish fresh from Union Hall and The English Market, Coolea Cheese and new season rhubarb and celeriac.